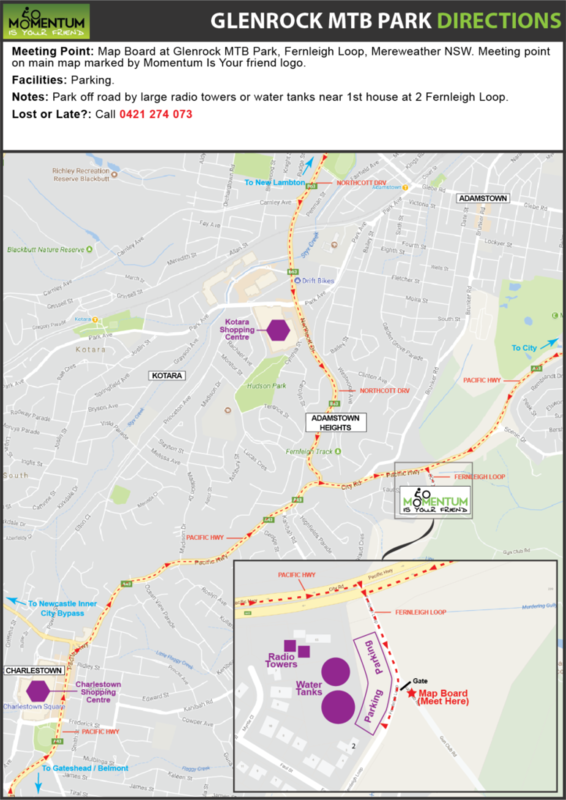 Downloadable maps and information for our Glenrock MTB Park location. The Glenrock MTB Park is within the boundary of Glenrock State Conservation Reserve. The reserve is multi-user however, the MTB park consists of dedicated mountain bike trails. The building and maintenance is undertaken by volunteer group The Glenrock Trails Alliance. Map Board at Glenrock MTB Park, Fernleigh Loop, Mereweather NSW. Meeting point on map marked by Momentum Is Your friend logo. Park off road by large radio towers or water tanks near 1st house at 2 Fernleigh Loop.